A few miles off the main highway and many miles back in time. It is a small village of 350 people nestled in a pocket of the Cerbat Mountain Range, Chloride is a peaceful place for tourists to visit and for others to retire to when you are finally ready to get away from it all. The elevation is 4,000 feet above sea level. Many of the present day citizens are retirees, artists, musicians, and the like. 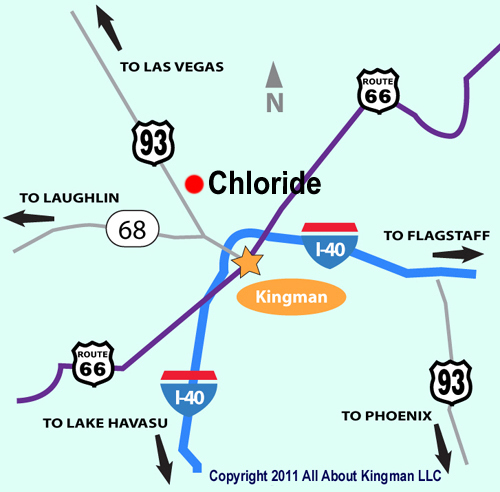 Chloride has an RV park with tent camping. 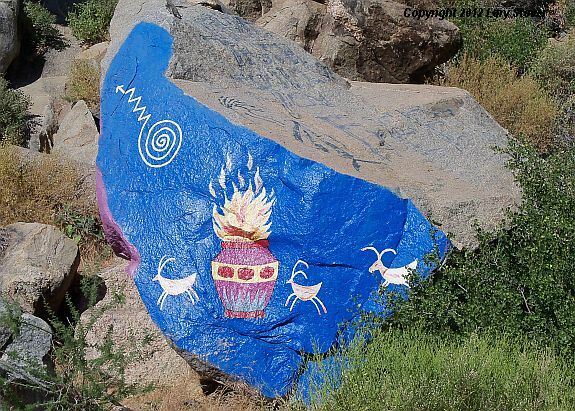 Just outside of town you'll find Roy Purcell's murals in a boulder-strewn side canyon. 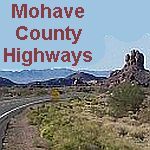 They depict desert scenes, cenes of weathered buildings, ghost towns, landscapes and symbolic figures under an all-seeing sun decorate rock faces on either side of the canyon. Western town set used every Saturday at noon by Chloride's gunfighter troupes.